What we can all learn from one inspiring man. People with disabilities face many barriers to employment. They can be physical; a wheelchair user cannot enter their office because their building does not have wheelchair ramps or an elevator. 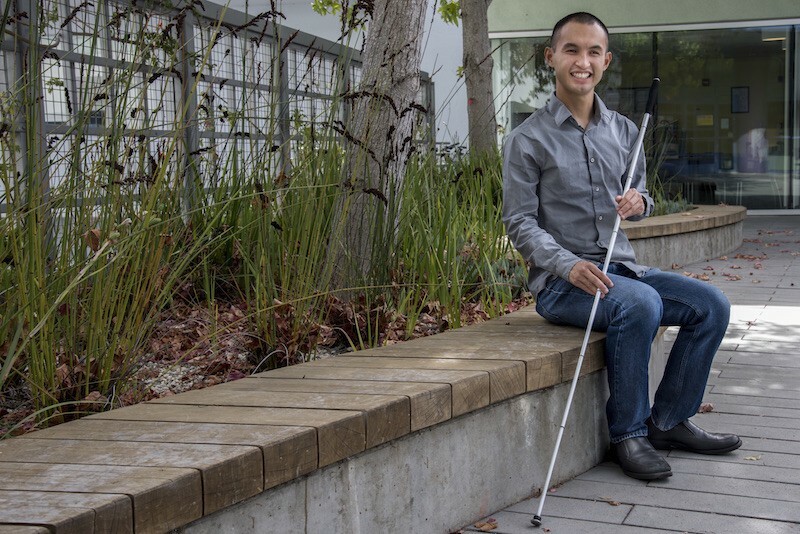 They can be technical; a visually impaired person, like myself, may not be able to access a computer program with the screen reading software necessary for their job. They can be emotional; a hearing impaired person feels left out because they do not have a sign language interpreter for team meetings. Every day, over 19 million working-age adults come up against these types of barriers. Many of these underserved and underrepresented people feel ashamed to request accommodations. They feel lucky to be among the 17.5 percent of people with disabilities to have a job, so they come to the conclusion that their employment is tenuous. People with disabilities often are afraid of being viewed as helpless or a liability by their coworkers. We do not want special treatment — we want to be productive and contribute just as much as our colleagues. But rather than dwell on the problems that people with disabilities encounter in the workplace — though there are plenty — I want to give my own perspective and advice so that those with disabilities can succeed. In order to succeed, it is vital to build a network of people in and out of your company/institution. By meeting other people with disabilities, you can learn how to request accommodations. Do not reinvent the wheel — other people have probably already gone through the same thing you have, and learning from them will save you a lot of time and emotional energy. They’re also more likely to be sympathetic to your struggles and sometimes, that can give you the strength you need to pursue your goals. That’s not to suggest, though, that you should only befriend people with disabilities. Those without disabilities can serve as your team of advocates when things get tough — and inevitably, they will. Plus, who doesn’t like having friends at work? Your friends want you to succeed, and just knowing that you have people there for you gives you a sense of security and acceptance. When asking for accommodations, make sure to do it confidently and with a smile. Sometimes, you might feel an urge to storm into your supervisor’s office and serve them with the Americans with Disabilities Act lecture, but remember that doing so should be a nuclear option. Instead, calmly state the problem that you are having clearly and concisely. If it helps, show them a demonstration of that problem. You should make it very clear that the accommodations you are requesting are necessary for you to get the job done, and that you very much want to get it done. You can also try to give the people in charge a personal stake in your success by asking for their ideas for a solution. Try asking, “How would you solve this problem if you were in my position?” If they can contribute to the problem’s solution, it becomes a win-win situation where you get your accommodations, and the supervisor feels a sense of accomplishment in helping you solve it. They are also more likely to follow up with you regarding the effectiveness of the accommodations. As a person with a disability, being proactive is necessary to succeed. It may not be fair that you have to do more preparation in order to work or study productively, but it is your reality. When I was an undergraduate at UC Berkeley, I had to plan out my schedule weeks before the semester began. I had to badger my professors for syllabi, purchase and submit books to be converted into braille six weeks before the first day of classes, interview and hire scribes so that I could do my homework, and schedule exams with the school proctoring services for students with disabilities. As a person with a disability, you have to be able to anticipate the necessary accommodations it takes you to succeed. You can learn about your needs through your own experience, and asking your network of friends with disabilities. Sometimes, you need to look at your situation through a lens of humor — this has really helped me personally. When I find myself floundering at work or in school, I have a strong urge to sit in my room and stream movies all day, but I found it more helpful to step back and laugh about my situation over a beer and chili cheese fries with my friends. Humor also makes you more approachable — despite the fact that people with disabilities make up 20 percent of the US population, many people have not had the opportunity to interact with us. Non-disabled people are sometimes afraid of offending us, resulting in their interactions consisting of awkward dancing around the elephant in the room. You can address your disability directly while making yourself more personable by poking fun at the situation. For example, being visually impaired, I have a computer that reads aloud text on the screen. I joke that I like it because it talks to me when I feel lonely — also, when you email me, you have a monotone male voice. Rather than focusing on what you cannot do, focus on what you can do. You learn so many valuable skills from being disabled such as communication, logistics, and adaptability to setbacks. Use these unique skills to your advantage, and do not let your disability be your defining characteristic. Rather, you are a multidimensional person with diverse abilities. You are unique, you have experienced things many people are deathly afraid of and you came out on top. Remember that. Newton Nguyen is a Climate Modeling Research Assistant at Lawrence Berkeley National Laboratory, triathlete and proud UC Berkeley alum. When he’s not reading up on politics or carbo loading for his next race, you can find him catching up with friends, getting bubble tea and trying to decide which Ph.D. program he should choose next year. Originally published at www.glassdoor.com on February 8, 2017.